There's nothing better than sitting in the park or garden with a glass of chilled wine. 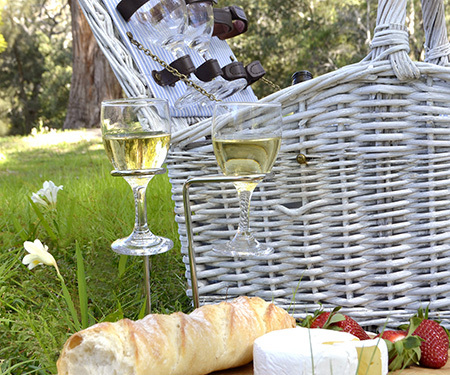 Trouble is - unless you drink direct from the bottle - where do you put the wine glass as you gorge yourself on the picnic? Until now you would have had to make do with a few spillages as you tried to balance the glass between a pair of smelly trainers. Well no longer! These very clever Steady Sticks are made of shiny stainless steel, and are easily pushed into the ground. They will keep a firm hold of your glass of Pinot Grigio, leaving you to worry about other stuff, like the rabid dog that's looking longingly at your pork pie. Pack contains two Steady Sticks (gift boxed). Suitable for Champagne glasses too!